Not too far from Sanchi, are two other interesting sights. 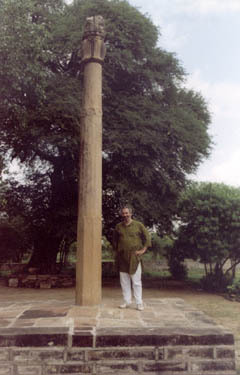 This is Heliodoros' Pillar, put up by the Greek ambassador from an "IndoBactrian" kingdom in what is now the Punjab, "in honor of god Vasudeva (Vishnu)" on converting to Hinduism. That's me by the pillar. We were not just the only tourists there, but also, from the stares, the first in a very long while. 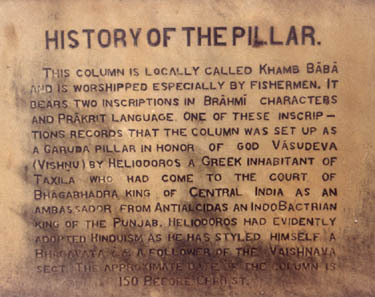 Below, is the description put up by the Archeological Survey of India, who face the overwhelming task of perserving all these little sites in addition to all of the larger, more important, ones. * The Concise Oxford Dictionary, 9th Edition, Oxford University Press, Delhi.